The votes have been cast, and the latest Legend of Zelda adventure has been crowned king by Kotaku and TAY readers. 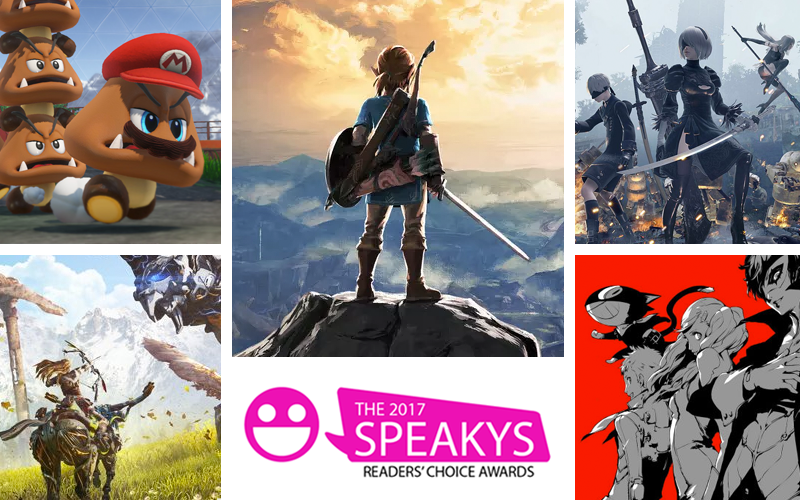 It stands as the first Nintendo game to claim such an honor in The Speakys seven-year history. Other titles such as Persona 5, NieR Automata, and Horizon: Zero Dawn also battled to top the list. Before we get to the list, I’d like to thank anyone and everyone who voted for the 2017 Speakys. We pulled in an all time best 31,209 votes this year, which is an incredible 7,000 vote increase from last year! Special thanks to Riley MacLeod and Ethan Gach for letting me share this over to Kotaku for more reader input, as well as everyone on Talk Amongst Yourselves who helped me curate the list of games released in 2017. Though there weren’t many write-in votes for one particular game, my favorites included: Ur mom, Shadow the Hedgehog, Poop, and (of course) Monster Girl Quest 3. Once again my mother has made the list, and I can’t wait to inform her. It seems like The Speakys get bigger and bigger each year. It’s insane to think I’ve been doing this for seven years., and I’m always amazed at the number of votes we manage to pull in. It’s going to be difficult to top 2017 in terms of quality games, but I’m sure 2018 will put up a good fight. When these awards first began in 2011 I introduced them in the Kotaku forum known as “Speak Up.” The Speak Up forum was merged with Talk Amongst Yourselves in the spring of 2013 and no longer exists. But since the gamers who read Kotaku still have a tendency to “speak up” about their opinions when it comes to games they love I’ve kept the name. I’m reading this in 2018, why are these “The 2017” Speakys? Because all the games listed launched in 2017.